Orbitsound ONE P70W – Connected Speaker Review with All-in-one Airsound, Subwoofer, Wi-Fi and more! It is always particularly interesting to test technology that has been developed by leaders in their particular sector, so I was very excited about visiting Orbitsound in London to have a demonstration of their ONE P70W Speakers. Orbitsound was founded by Ted Fletcher, the inventor of Airsound™ technology. Ted has been working for many years as a musician, audio engineer, electronics designer and studio designer, to give the listener a more realistic, more immersive sound experience. These years of experience in the industry led to the release in 2017 of the Orbitsound ONE P70, the worlds first multi-orientation speaker, meaning regardless of where you stand, it sound remains the same. The P70W is designed in such as way that it can be shelf or wall-mounted. It has a narrow design (700mm wide x 173mm deep x 77mm high), this allows for comfortably mounting below a flat screen television or on a wall as a ‘party’ speaker. It’s built from wood and steel and can be purchased in matte black, bambo or bone white weighing in a 5.1kg. Sound is provided by two (front and top) 2″ ‘Orbitsound MK4 drivers’, a Sub-bass low-profile 5.25″ driver and 2X2 Airsound Orbitsound MK4 drivers. By positioning the main speakers both front and top mean that sound production is maintains regardless of how the speaker mounted. Connectivity is provided by Bluetooth, Optical cable, 3.5mm stereo jack and the Wi-Fi. The Wi-Fi feature is the most impressive as it allows streaming of audio from a variety of sources without the loss of quality associated with Bluetooth, effectively allowing for uncompressed playback of music. It also allows for multi-speaker / multi-room playback with perfectly synchronised sound and zero delay. This is achieved by using the Orbitsound Smartphone app (Android and iOS) which supports streaming providers and internet radio stations and allows you to ‘group’ sets of speakers to create one virtual speaker. When I was given a demonstration of this at the Orbitsound offices, 3 separate speakers, both wall and shelf mounted were grouped together using the app. I was then asked to close my eyes to try and decide where I thought the sound was coming from. It was unearthly as it sounded like it was coming out of thin air, very impressive! The app currently supports TuneIn, iHeartRadio, Spotify, Tidal, Napster, Apple Music (iOS only) and of course your own device stored music. If you are absolutely focused on using other services such as Google Play Music or Amazon, then you can of course stream using Bluetooth. I used the speak in conjunction with my Amazon Dot, as well as my iMac and Xperia XZ Premium, all worked flawlessly. I was also able to connect the speaker to my Freesat HD box using the supplied optical cable. This worked great, although the Freesat box had a bug with Netflix which meant it would only broadcast Dolby sound. This was a simple configuration on the Freesat box and all was working again. The speaker comes with very nicely designed remote control and you can also use you own remote control using the speakers ‘learning mode’. I was able to control the speaker using my TV remote within a couple of seconds of setup. The people at Orbitsound definitely had the environment in mind when they designed the P70W as it is built to power-down components that aren’t used, but power up instantly when required. Quite a bit of thought has gone into small details on the P70W with the inclusion of reversible LED information display and Orbitsound badge. This might seem small things but they count as you really wouldn’t want to be showing off your new speaker to friends and have the badge upside down. integrated wall mounting and 200mm VESA bosses and bolts are included to allow you to get going straightaway with unnecessary visits to AV stores to buy mounting kits. There is also a protective sleeve for the speaker, to protect it when not in use. The speaker also comes with a standard power cord, aux cable, quick-start guide and safety and warranty information, all packaged up in a very smart box. The useful inclusion of a carry handle was helpful too, as I carried a demonstration unit to the train station. The Orbitsound P70W feels like a speaker that can fit many needs, be that as a Sound-bar for your TV, a party speaker for gatherings of people and the facility to extend your listening experience to multiple speakers. The smart design of the speakers means that it they would sit very comfortably in a professional or public environment. The whole family has really enjoy the quality and versatility of the speaker and we’ll be sad to see it go. At £399, the Orbitsound P70W is great value for buyers looking for a richer smoother sound regardless of their position in the room. Finally we make it to Episode 83 with our first proper Gadget Man of 2016. This week I chat to Mark about the Edifier R1800BT Bluetooth enabled Book Shelf Speakers. These are really lovely to listen to and have been either side of my iMac for the past couple of weeks. They even come with their very own polishing cloth! Listen in to the audio stream above and stay tuned for our upcoming episode where we will be chatting about the Tesla Model S P85D with Auto Pilot!! 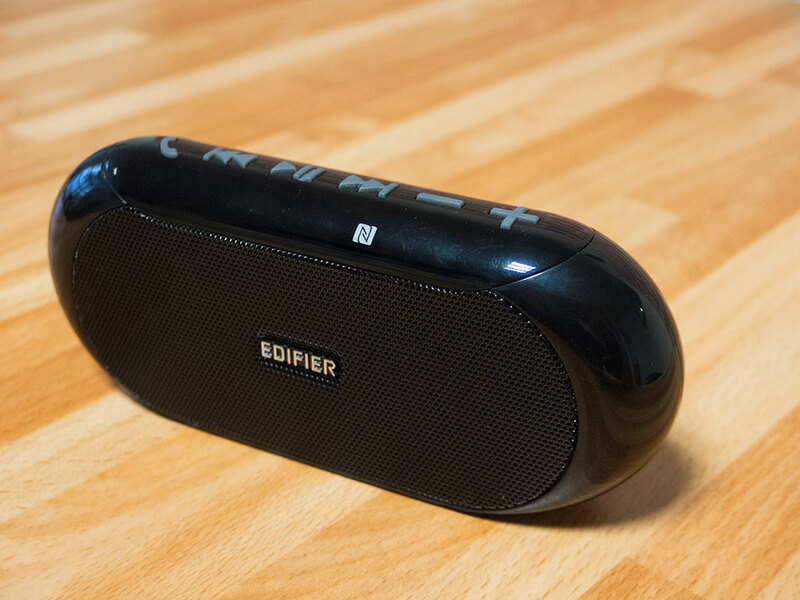 This week I have been able to sample the audio delights of bluetooth streaming with the Edifier MP211 Wireless Bluetooth Speaker with NFC. This is a very nice wireless speaker solution for people looking for a mobile solution to playing their music quickly and easily. Listen in to the stream to find out all about it, full review of the product coming up shortly.